Since My Posts appear on several Blog, sites reader comments are not all in one place. So here is a compilation of some of the more recent comments to my GreenLight Posts. 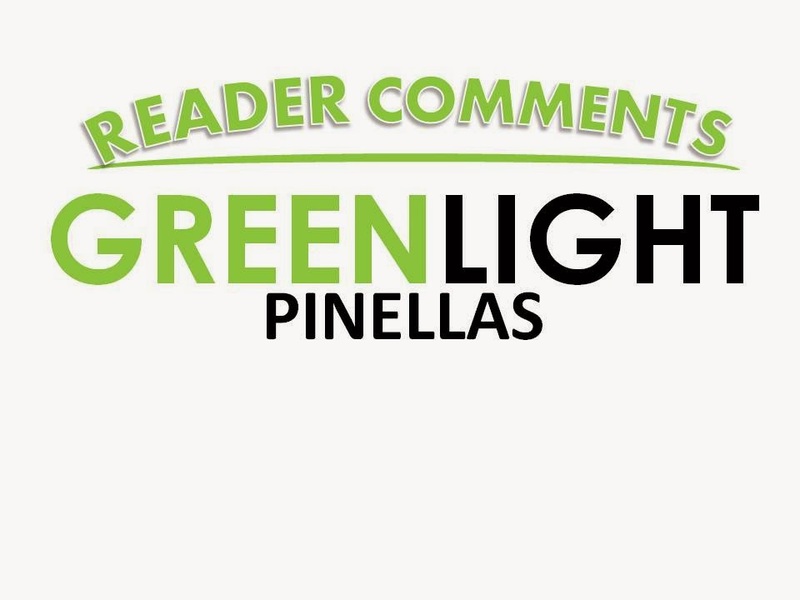 JS- I saw this comment after one of the newspaper articles:...... "The Greenlight plan promotes extensive REAL ESTATE development along the tracks of the new $2 BILLION train from St. Pete to Clearwater. The Yes Greenlight promoters are realtors, developers, contractors and politicians. These donors want to remain anonymous because that is who they are. The green in Greenlight is not about transit, it is all about money......." "Ronnie E. Duncan is a Founder and President of THE DUNCAN COMPANIES, INC., a Tampa, Florida-based commercial REAL ESTATE firm with regional offices in Fort Myers and Boca Raton, Florida; Phoenix, Arizona; and Atlanta, Georgia." http://www.theduncancompanies.com/president.htm ........." "Our mission is to provide fully integrated REAL ESTATE solutions that will optimize the real estate portfolios of our private and public sector clients." Ann Duncan, President and Founder of Vertical Integration (Ronnie's wife) http://www.vertical-integration.com/ ........." As usual, follow the money."........... That pretty much sums it up for me. county area in their jurisdiction. Duncan's actions have destroyed that trust and make the full and faithful discharge of duties impossible for him and TBARTA. The only action that can restore that trust is his removal or resignation from TBARTA. J - Here's a novel idea, if there is SO much demand for light rail, let a private entity build it and run it. Let's go a step further and get rid of PSTA altogether. The 30 million in taxes can instead be used for vouchers for low income/disabled people to take a freaking cab EXACTLY where they need to go. Problem solved. You're welcome. BC - I am convinced that ego is the reason so many pols want a train. They want a big splashy project with a brass plaque to put their name on. I don't think any of them have taken the time to try to figure out how many people are likely to ride a train, where they want to go on the train, or how they are going to get to and from the train station. And I figure that this new tax is going to cost me a net $800 a year (assuming the transportation tax is dropped from my property tax bill). $800 that I will no longer be able to spend or save as I see fit, squandered on a politician's trophy that neither I or my family will ever use. You can find my Posts on any Pinellas County PATCH site and on my Blog Bay Post. Check out the GreenLight Posts and add your comments pro or con.